Simple mirror of the application for movements 1-3. The Heian version follows the Pinans for this section of the kata where it didn't for the first 3 movements. The sequence begins with the opponent standing facing you, having a grip of your right hand, wrist or forearm with his left hand in a cross body grip. 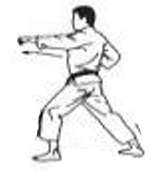 By rotating your left arm round in the tettsui or gedan-barai motion you are able to get a grip on the opponent's wrist and cause him to bend over forwards. The step forward and punch simply grabs the opponent's collar, hair or whatever is available at neck level. Step back round 90° and execute gedan-barai in zenkutsu-dachi. This movement pulls the opponent over backwards strongly using whatever you have hold of. This video example is published on Youtube by Sensei Richard Poage of the Peaceful Warrior Martial Arts and Healing Center. It's done to the other side, but the application is the same for the right side.